Northbrook Community Concert Band is a well-established local wind band, constantly developing in expertise and experience. It was formed in the Spring of 1999 with a total of eight instrumentalists to provide on-going musical education for amateur adult/young musicians. The band, which has now grown to 35 plus players, meets every Tuesday evening from 7 until 9 pm. We comprise standard concert band instrumentation: wind, brass and percussion, and accept anyone of a reasonable musical standard. The band plays a variety of musical works from light classical through to marches, show tunes and big band jazz. Are you a player looking to for a place to play, to improve or to perform? 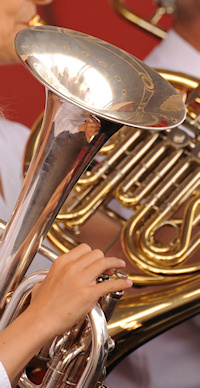 We have places for most wind instruments, for percussion, and welcome players of all ages and ability. Please contact Ruth or Karen (details below). Over the years the band has performed at many functions, raising money for a number of charities. A highlight of the band’s concerts was in 2003, when it was asked to play in the Baron’s Hall at Arundel Castle. The band’s first musical director was Norman Warnes MBE, a retired RAF Squadron Leader and a former conductor of the RAF Central Band, who conducted the band for five years before moving to Lytham St Annes. Keith Tellick, our last Musical Director, is the principal horn of the Central Band of the Royal British Legion. His varied professional commitments led to him working with Sir Peter Maxwell Davies and the Royal Philharmonic Orchestra on two world premieres, recorded live on BBC Radio 3. Keith took over in 2003 following Norman’s departure and built on the fine work laid down by him. The players in the band come from a variety of backgrounds and consist mainly of adults and talented youngsters, but we all share the same love of music-making, entertaining and simply enjoying playing. If you can complement us, you will be welcome.